When Buddhist monastics chance to meet in the West, where our numbers are few, an instant joy of recognition http://dharmafriendship.org/ arises. While our shaved heads and robes may appear strange, confusing, or even threatening to the general public, they signal shared aspirations, values, and lifestyles to other renunciants. 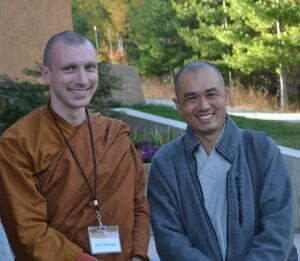 Tan Suhajjo (left) from Pacific Hermitage and Venerable Zhihan from Vancouver, B.C. You can imagine, then, the delight and camaraderie derived from the first international gathering of nuns and monks in the Northwest, this October. Representing Theravada, Korean, Chinese, Tibetan, and celibate Soto Zen traditions, 31 monastics attended, eight from the Northwest. Northwest monastics included Ajahn Sudanto and Tan Suhajjo, monks of the Thai Forest tradition from the Pacific Hermitage in White Salmon, Washington; and Venerable Zhihan of the Chinese Mahayana tradition, from Vancouver, B.C. Sravasti Abbey, the Buddhist monastery north of Spokane, hosted the 21st Western Buddhist Monastic Gathering October 19 to 23. It is an annual conclave where nuns and monks of all Buddhist traditions share and learn from each other. 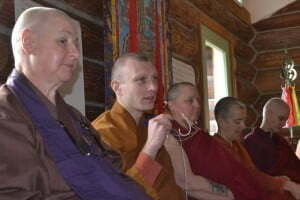 Five of Sravasti Abbey’s 11 monastic residents, practicing in the Tibetan tradition, also attended. The rest of the community, along with local lay volunteers, supported the event. 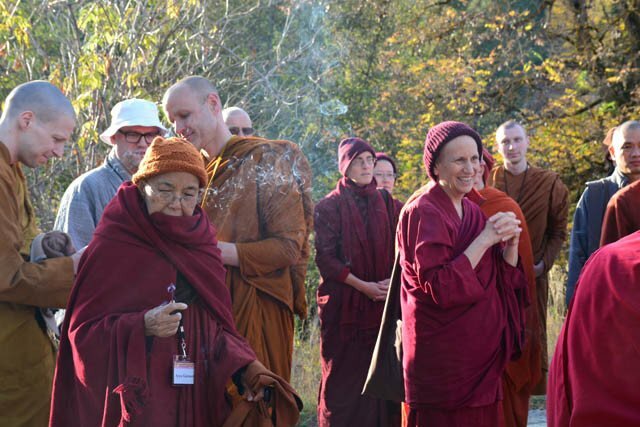 Hosting the gathering fulfilled a long-held dream for Venerable Thubten Chodron, founder and abbess of Sravasti Abbey. She has regularly attended the monastic gatherings around the world, since the first meeting in 1995, and drew ideas and advice from the group on how to set up the abbey. 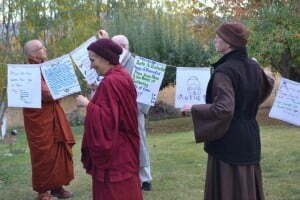 Venerable Thubten Chodron (left), abbot of of Sravasti Abbey, helps hang prayers flags to bless Sravasti Abbey’s land. Drawing on her 38 years of monastic experience, Venerable Chodron gave the opening talk. She recounted some of her own earlier difficulties—rejection by family, poverty, illness, and sexism among many others—and how she applied Buddha’s teachings to work with these. This has brought her conviction in the dharma, and joy in her monastic life. Ajahn Sudanto and Venerable Zhihan both served on a panel called “In the Trenches.” Each described his work in setting up new centers or monasteries. For Ajahn Sudanto, it was a challenge to keep things simple, as he established a community of alms-mendicant bhikkhus in a small town. One of his present joys is how Pacific Hermitage has integrated with that community, teaching meditation and dhamma classes and providing spiritual support. Venerable Zhihan described the challenges and joys of organizing a city-wide Vesak celebration in Vancouver, as well as in helping to bring the teachings in Spanish and Portuguese to dharma centers in South America. For inspiration, he said, “I try to imagine how Buddhism traveled from India to China and how long it took. It took 1,500 years to translate what we have today—the Chinese Tripitaka,” the Chinese canon of the three “baskets” of Buddha’s teachings. Tan Suhajjo (center) from Pacific Hermitage, shares his reflections in the closing circle. This history helps bring perspective. “Here, we’re in the very beginning stage of the dharma transmission from Asia to the West,” he said. He exhorted the gathering to “harness sangha power,” to help spread the Buddha’s teachings. The group took one afternoon for blessing the abbey’s land. Nuns, monks, and lay people carried incense and chanted mantras, while they circumambulated the main building. There were also numerous small group and individual conversations, especially about establishing ordained sangha communities in the U.S. Through the week, the joys for this group clearly overshadowed the challenges, as people shared their gratitude for living in the monastic precepts and their love of sharing the dharma with others. 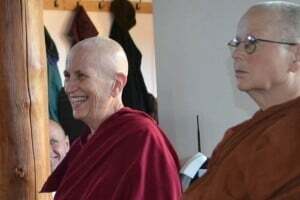 Venerable Chodron (left), and Ayya Sobhana from Dhammadarini Vihaar in California. A gathering like this is still unique in the world. In the past, due to circumstances of time, vast distances, and dangerous travel, Asian Buddhists from different countries and practice traditions rarely had a chance to meet. Thus, many misconceptions arose about one another’s practice, misunderstandings that linger to this day. Here in the West, however, we have an opportunity to dispel the confusion. His Holiness the Dalai Lama, in his recent book “Buddhism: One Teacher, Many Traditions,” encourages Buddhists of various traditions to learn about each other. Theravada monastics chant their blessings. The book was co-written by Venerable Chodron. Events like the Western Buddhist Monastic Gathering—and the activities of Northwest Dharma Association as well—have been contributing to cross-tradition understanding for more than two decades. There are challenges, yes. And we can rejoice in how these help us to grow and celebrate the joys. May such opportunities endure for a long, long time!